ADDIS ABABA: 10 BEST THINGS TO DO IN ETHIOPIA'S CAPITAL – Satenaw Ethioopian News & Breaking News: Your right to know! (CNN) — Rambunctious, manic, beguiling, exciting — it’s hard to accurately describe Addis Ababa. 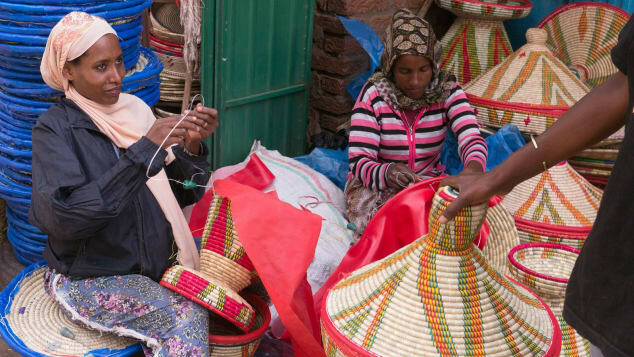 Ethiopia’s capital, which translates as “New Flower” in the country’s Amharic language, shows little sign of losing its youthful, lusty edge and is the pulsing heart of this eclectic nation’s resurgence as one of the world’s fastest-growing economies. “Addis,” as it’s often simply known, is the world’s third-highest capital city at 2,400 meters, and has worn its heart on its sleeve since it was founded by Ethiopian Emperor Menelik about 1892. Life is lived very much outdoors on its bustling streets thanks to comfortable temperate weather boosted by months of nonstop sunshine. “Perhaps the highest praise one can direct at this chaotic, contradictory and compelling city is this: Addis Ababa does feel exactly as the Ethiopia capital should feel — singularly and unmistakably Ethiopian,” says travel writer Philip Briggs. Here’s 10 of the best things to check out when you travel to Addis. 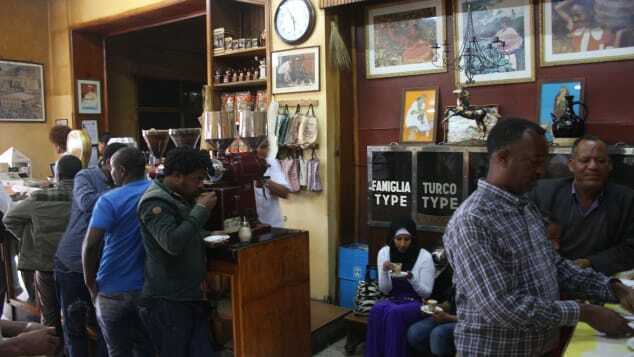 Ethiopia is famous for its coffee and Tomoca is one of the oldest joints in town. It’s impossible to separate Ethiopian culture — that unparalleled Ethiopian-ness — from coffee. This is the land of the finest Arabica coffee — as legend would have it, discovered by an Ethiopian shepherd boy and his goats sometime around the sixth century. And Addis is the city of cafés, traditional coffee stalls in bars and restaurants, and women walking the streets with thermos flasks — all dispensing potent high-quality coffee. All modes of coffee distribution are worth trying, though you may struggle to sleep for some time afterward. One of the city’s first roasters and deserving of legendary status is the original Tomoca Coffee shop off Churchill Avenue (Tomoca, Wawel St, Addis Ababa; +251 91 122 1412). Extra tip: The delicious Ethiopian version of a macchiato is worth a try — many foreigners confess to being unable to start their days without two of them. Or you could ask for a spriss, which is half coffee and half tea. Addis Ababa’s arts scene is thriving. Makush Art Gallery is a popular draw. 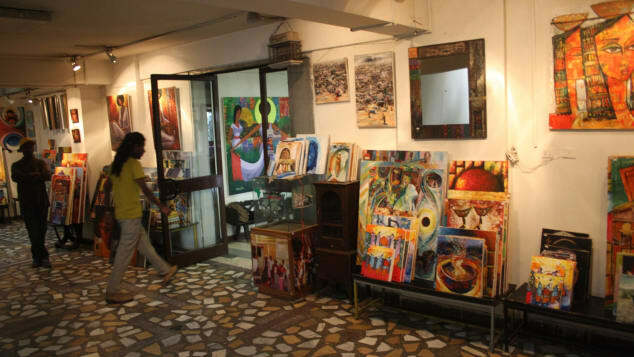 Ethiopia’s expanding art scene is aptly demonstrated by the 600-plus painting collection at Makush Art Gallery off Bole Road. Another good spot is Asni Gallery and Café in Kebena. Many hotels, such as the Hilton and Radisson Blu, do a good job of displaying impressive works by local artists. When it comes to fashion, Ethiopian designers like to combine the old with the new as illustrated by the Mafi label of Mahlet Afework, one of the best known and most daring designers. Extra tip: When it comes to shopping, the Mercato market — one of Africa’s largest — occupies a swathe of the city easily missed by tourists. It’s an eyeful to say the least, in which anything appears to be available, though it’s best go with an Ethiopian guide, and with a watchful eye on your pockets. Ethiopians are superb dancers. Regardless of age, all Ethiopians appear to relish the chance to hit the dance floor (or turn any location into a dance floor). And they love it when a foreigner joins in, or at least tries to. You can’t beat finding a so-called “azmari bet” for live music and to witness the wild, eye-popping traditional iskista dance of the Amhara people. Ethiopians take their history very seriously, and they have good reason: Ethiopia has one of the world’s oldest Christian traditions. It was one of only two African countries not colonized, plus it’s widely accepted that the first humans came from the Rift Valley running through Ethiopia. Hence, in the National Museum of Ethiopia, you’ll find the legendary Lucy, the oldest and most complete hominid skeleton ever discovered, which was found in the northeastern Danakil desert (an amazing travel experience itself). (National Museum of Ethiopia, King George VI St., Addis Abab; +251 11 111 7150). Then there’s the treasure trove of the Ethnological Museum, on the Addis Ababa Universitymain campus (Algeria Street, Addis Ababa; +251 92 074 7162), showing the full sweep of Ethiopia’s cultural and social history across two floors filled with all sorts of ancient artifacts, Ethiopian art and religious icons. Extra tip: Addis Ababa serves as the hub of Ethiopian Airlines, which provides an excellent domestic service to visit the historic marvels around the country such as Lalibela’s rock-hewn churches and Harar’s ancient walled city. 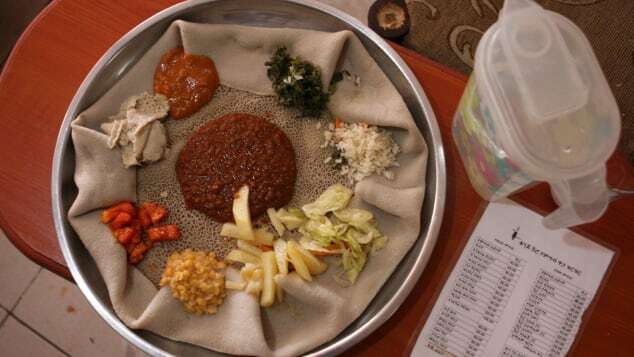 Injera is Ethiopia’s national dish — a grey, spongy bread with vegetables and sauce toppings. It’s a rite of passage to try local staple injera — a spongy pancake-like bread piled with various meats, vegetables and delicious hot sauces. Addis has a number of well-known traditional restaurant options, which typically also put on traditional dancing displays while you eat. The 2000 Habesha Cultural Restaurant is a longstanding favorite (Namibia Street, Addis Ababa; +251 11 618 2253). Farther from the city center is Totot Restaurant (+251 11 646 0718) in Mebrat Hail, specializing in kitfo, a spicy minced beef dish often praised by Ethiopian supermodels for its nutritional powers. Extra tip: It’s well worth diving into any of the thousands of local eateries serving traditional Ethiopian fare — it’s relatively safe to go truly local as food is well prepared. You shouldn’t be deterred by windows full of carcasses that accompany most local restaurants: meat doesn’t come fresher, served straight from the fire. If you end up feeling the need for some more familiar sustenance, there are plenty of Western-styled restaurant options in Addis because of the city’s role as a diplomatic hub with a large expat community working for international organizations. Ristorante Castelli (Mahatma Gandhi St, Addis Ababa; +251 11 157 1757) is one of the most famous, an Italian restaurant in the old Piazza area that has fed royalty, film stars and ex-US presidents. Other restaurants frequently recommended by Addis residents include Italian restaurant Grani di Pepe (28th Roundabout Abuare, Addis Ababa; +251 93 370 6647) and Belgium-themed Le Grand Rêve (+251 94 670 7892). At Sky Steak House on the 8th floor of Dreamliner Hotel you can enjoy a good steak while watching airplanes taking off and landing at Bole International airport. Sichuan Restaurant(Oda Bldg. 3rd Floor; Kassanchis; +251 91 160 3926) is recommended for quality Chinese food. Extra tip: If you’re simply after a good old-fashioned burger then most say you can’t beat Sishu Restaurant (+251 92 006 1063) on Alexander Pushkin Street. 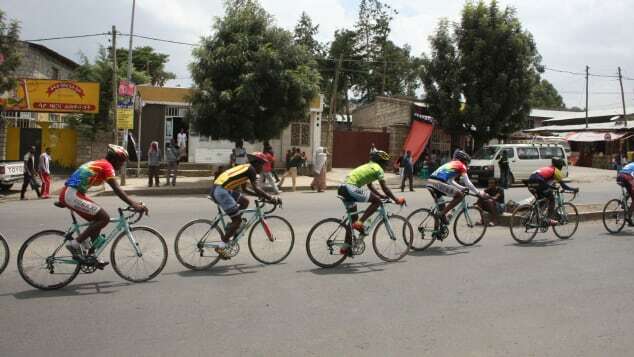 Cycling, running and soccer are the favorite sports in Addis. Most weekends there’s usually a cycle race somewhere in Addis, drawing enthusiastic crowds and a festive atmosphere as people sit outside bars and cafes drinking beers under the sun. The soccer stadium at Meskal Square is a raucous experience — Ethiopians are soccer mad. Any weekend bars across the city are full of impassioned Ethiopians watching the English Premiership soccer league, clasping their heads in horror or cheering the goals. And of course there’s running — the Great Ethiopian Run is an annual 10-kilometer road-running event growing in reputation and popularity that takes place in late November. Extra tip: Ethiopian sport is getting more diverse all the time — rally car driving is taking off, with a number of events held throughout the year. For those after sheer luxury, Sheraton Hotel (Taitu Street, Addis Ababa; +251 11 517171), built by Ethiopian billionaire Sheikh Mohammed Al Amoudi, remains an expensive treat, occupying a parallel dimension in central Addis. Even if not staying, it’s worth wandering round the palatial grounds. There’s longstanding favorite the Hilton (Menelik II Ave., Addis Ababa: +251 11 517 0000), where the journalists who camped out during former days of tumult and revolution are now replaced by business folk gathering at the poolside bar and restaurant to thrash out deals. Extra tip: Ras Hotel (Gambia St, Addis Ababa; +251 11 551 7060) occupies a superb central location on Churchill Avenue. Its patio bar and restaurant is a long established popular rendezvous spot for locals, and a good central spot for a pit stop when exploring the city. There’s bound to be a few surprises in a city of about five million people that’s capital of a country with a cultural, historical and linguistic identity quite distinct from the rest of Africa. You can watch the sun rise from a rocky outcrop atop Yeka hill overlooking the area of Megananya to the east of the city before visiting the nearby 700-year-old rock-hewn church of Washa Michael. Or there’s the Horn of Africa’s first space observatory high in the Entoto hills encircling the northern reaches of the city. As well as offering great panoramic views over Addis, it’s an indication of how far Ethiopian development wants to go. Extra tip: At street level, another local custom is the tiny juice bars dotted all over the city serving delicious mixes of freshly squeezed juices. Learning a few words of Amharic will go a long way with the locals. Similar to dancing, Ethiopians, young and old, love it when foreigners try to speak their language. Just one word is usually a great way to break the ice. It can be a mind-bogglingly diverse country for linguists with more than 80 dialects, but in Addis Ababa, Amharic is the most applicable. James Jeffrey is a freelance journalist based in Addis Ababa, from where he writes about Ethiopia and the Horn of Africa for various international media. Twitter: @jamesinaddis. Rambunctious, manic, beguiling, exciting — it’s hard to accurately describe Addis Ababa…. Rambunctious, manic, beguiling, exciting — it’s hard to accurately describe Addis Ababa.